Happy Imbolg! This ancient Gaelic celebration falls halfway between the Winter Solstice and Spring Equinox. It’s traditionally a time of divination – of weather in particular, watching to see if serpents or badgers emerge from their dens (the basis for the American Groundhog Day). It also marks the beginning of the growing season, the lighting of candles and fires representing home and hearth, and the power of the sun as the days grow longer. At this beginning of spring, when the Earth begins to wake up from deep within its wintertime slumber, B. and I celebrate fifteen years together at Salt Point State Park. Ivory-stemmed, red-capped russula emetica, the Sickener (no, we didn’t eat it!). A vivid yellow (possibly a gilled bolete). A lovely pale lavender (cortinaria?). Endlessly amusing puffballs. “Little brown mushrooms,” discarded because we couldn’t identify them (many such mushrooms are highly toxic; spore prints are the best way to positive ID). 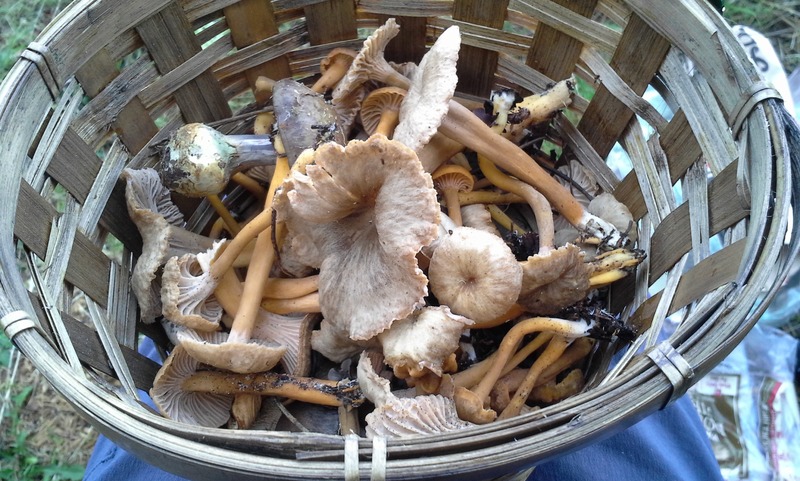 Then B. spied our jackpot under a low underbrush of huckleberry bushes and oak: hedgehogs, chanterelles, and black death trumpets (non-toxic, they’re black chanterelles, and delicious). Note: please be respectful and tread lightly on the land, and ONLY forage with experts like a local mycological society or if you’re absolutely sure of the mushrooms you identify. This entry was posted in Birds, Family, Local Area Hikes and trips, Nature, Seasons, Uncategorized, Weather and tagged Birds, Fire, Gaelic, Imbolg, Nature, Pagan, Salt Point State Park. Bookmark the permalink. 8 Responses to Who’s ‘Shrooming Who? I LOVE your posts on ancient celebrations. There’s always a corresponding Jewish celebration which only confirms that everything comes from “pagan” nature celebrations. Tomorrow (Feb 3) is Tu B’Shevat, or the New year of the Trees, when trees are traditionally planted, and it’s a custom to eat a “new” fruit like grapes, figs, pomegranates, olives and dates. Oooh, how fascinating. I feel like there’s so much to learn about all these holidays, thank you for telling me about Tu B’Shevat. What a beautiful tradition. You guys have way more courage than me! I love looking at wild mushrooms but I don’t think I could ever trust my ID skills that much. I would never eat anything we foraged unless we were positive – and we’re only positive about those 2-3 kinds, basically! Multiple organ failure? no thanks! Aaah this brings back North CA Coast foraging memories ;) Yum! I love how you give the roots and origins of holidays. Thank you! Thank you for your support! I appreciate all the great feedback from readers, feel like I learn so much! I would be too afraid to ‘forage’ for mushrooms by myself. As my post ‘Mushroom in the Woods’ said–my mom scared me out of every considering hunting for mushrooms except at the grocery store. Probably best to be safe; we did choose those that had no poisonous counterparts, so have been very lucky in enjoying the fruits of our foraging (but fortunately you don’t need to pick mushrooms to enjoy a walk in the forest)!